Migrating content to a new content management system (CMS) is typically a significant effort. It can be difficult to locate, capture and migrate digital assets that are in legacy CMS or scattered across multiple internal sources— along with collecting content from external sources like websites and storing it in a centralized repository. Traditional, manual approaches for extracting and transforming content are time-consuming, inefficient and costly. 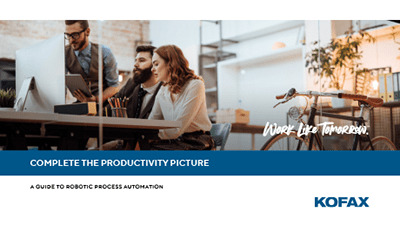 Kofax RPA enables you to accelerate content migration by deploying robotic process automation for the required steps. Replace manual, outdated methods for migrating content with a proven, best practices approach that reduces the associated costs, time and labor. Apply metadata across both new and legacy content to ensure a seamless, optimal search experience for your users. Leverage content migration best practices and tools to efficiently move assets, starting with an automated inventory of all enterprise content. Build a step-by-step plan and run software robots at any time to automatically extract, transform and integrate content. Continue to enable access to content during the migration, minimizing disruption to your daily operations. Automatically extract all asset metadata, then clean and transform it according to your pre-established business rules. Load the data into your CMS using automated workflows. Deploy smart software robots to easily synchronize content between multiple applications or systems. Run automated workflows to grab content from one system and integrate it with your new CMS. Develop robotic automation processes to inventory and migrate content across disparate sources without the need for costly, time-consuming coding. Save thousands of man hours and migrate a high volume of documents in days, not months.